The three major sub-regions of Oceania. 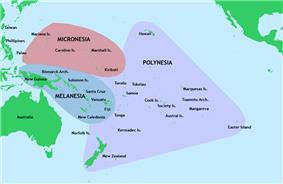 Pacific Islander is a term used to refer to the people of the Pacific Islands. The islands scattered across a triangle covering the east-central region of the Pacific Ocean. The triangle is bound by the Hawaiian islands in the north, New Zealand in the west, and Easter Island in the east. The rest of Polynesia comprises Samoan islands (American Samoa and Samoa), the Cook Islands, French Polynesia (Tahiti and The Society Islands, Marquesas Islands, Austral Islands, and the Tuamotu Archipelago), Niue Island, Tokelau and Tuvalu, Tonga, Wallis and Futuna, and Pitcairn Island. The island of New Guinea, the Bismarck and Louisiade archipelagos, the Admiralty Islands, Bougainville Island, Maluku Islands, Papua New Guinea, the Solomon Islands, the Santa Cruz Islands (part of the Solomon Islands), New Caledonia and Loyalty Islands, Vanuatu (formerly New Hebrides), Fiji, Norfolk Island, and various smaller islands. The Pacific Islands may also refer to any of the other islands in the Pacific Ocean. In 2008 a newly announced Pacific Islander guestworker scheme provides visas for workers from Kiribati, Tonga, Vanuatu and Papua New Guinea to work in Australia. The pilot scheme includes one country each from Melanesia (Vanuatu), Polynesia (Tonga) and Micronesia (Kiribati): countries which already send workers to New Zealand under its seasonal labour scheme. Australia's pilot scheme also includes Papua New Guinea. Local usage in New Zealand uses "Pacific Islander" (or "Pasifika") to distinguish those who have emigrated from one of these areas in modern times from the indigenous New Zealand Māori - who are also Polynesian but arrived in New Zealand centuries earlier. In 2013 7.4% of the New Zealand population identified with one or more Pacific ethnic groups, although 62.3% of these were born in New Zealand. Those with a Samoan background make up up the largest proportion, followed by Cook Islands Maori, Tongan and Niuean. Some smaller Island populations such as Niue and Tokelau, have the majority of their nationals living in New Zealand (Smelt, and Lin, 1998). To celebrate the diverse Pacific Island cultures, the Auckland region hosts several Pacific Island festivals. Two of the major ones are Polyfest; which showcases performances of the secondary school cultural groups in the Auckland region, and Pasifika; a festival that celebrates Pacific Island heritage through traditional food, music, dance, and entertainment. According to the U.S. Bureau of the Census, Population Estimates Program (PEP), a "Native Hawaiian and Other Pacific Islander" is "a person having origins in any of the original peoples of Hawaii, Guam, Samoa, or other Pacific Islands. It includes people who indicate their race as 'Native Hawaiian', 'Guamanian or Chamorro', 'Samoan', and 'Other Pacific Islander' or provide other detailed Pacific Islander responses.". ^ "Pacific Islands on Encyclopedia Britannica". ^ "South Sea Islander Project". ABC Radio Regional Production Fund. Australian Broadcasting Corporation. 2004. Retrieved 2008-08-27. Recognition for Australian South Sea Islanders (ASSI) has been a long time coming - it was not until 1994 that the Federal Government recognized them as a distinct ethnic group with their own history and culture and not until September 2000 that the Queensland government made a formal statement of recognition. ^ Note that Australian classification standards code Pacific Islander, Oceanian, South Sea islander and Australasian all with code 1000 - ie identically. This coding can be broken down into the finer classification of 1100 Australian Peoples ; 1200 New Zealand Peoples ; 1300 Melanesian and Papuan ; 1400 Micronesian ; 1500 Polynesian. Note that there is no specific coding therefore for "Pacific islander". See: "Australian Standard Classification of Cultural and Ethnic Groups (ASCCEG) - 2nd edition" (pdf - 136 pages).